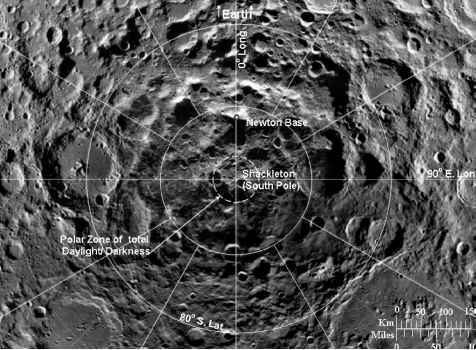 Mons Malapert1 in the south polar region of the Moon, may be the best location for the first lunar base. This feature is located at longitude 2° east, latitude 85.75° south (see Figures 5.1 and 5.2). The vertical distance from terrain near the base of the mountain to the summit may be as much as 8,000 meters. 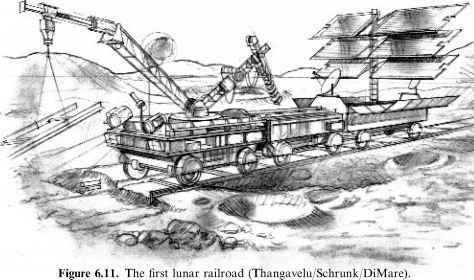 However, the summit of the mountain is calculated to project approximately 4,700 meters above the 1,738-km lunar reference radius of the Moon. The difference in these elevations is explained by the fact that the base of the mountain lies approximately 3,000 meters below the lunar reference radius of the Moon. Moreover, an unnamed crater immediately south of the peak is a possible "cold trap" that may contain water-ice (Margot et al., 1999). 1 This feature has not been assigned a formal name by the International Astronomical Union. We refer to it as Mons Malapert because it is (a) adjacent to Malapert Crater, (b) lunar mountains are traditionally referred to as "Mons" or "Montes" (plural). Figure 5.1. 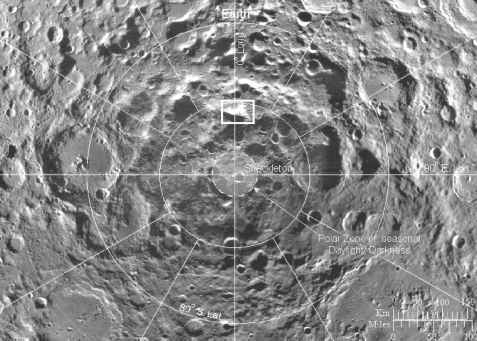 Earth-based radar image of the south polar region of the Moon. 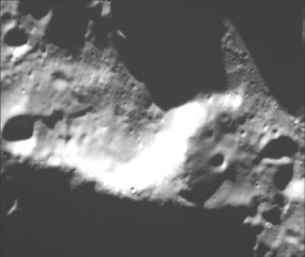 Mons Malapert, located at longitude 2°E and latitude 85.75°S, is highlighted (image courtesy of Margot et al., 1999). Figure 5.2. Clementine 750-nm image of Mons Malapert (detail from Figure 5.1). Note the small crater at the left (west) side of the summit. Figure 5.3. Newton Base at the summit of Mons Malapert (Margo et al, 1999; Sharpe). 2 Although a "Peak of Eternal Light" (at which sunlight is always available) has been identified at the lunar north pole by the SMART-1 orbiter, we still prefer the south pole because of the surrounding topography. The larger craters in the south pole area also provide more possibilities for larger deposits of water ice. 3 Considerable uncertainty - plus or minus a kilometer or so - still exists as to large-scale absolute elevations of features in the lunar polar regions, and smaller but still significant uncertainties exist with respect to relative elevations. The most conclusive way to determine these relationships will be to go there and take sightings.